We see the word “hope” written everywhere: engraved on necklaces, stamped on stickers, typed out in social media posts. I never knew the weight it carried. Have we ever stopped to think about what the word hope actually means? I can honestly say I did not know what hope was until this year. Through a year I never saw coming (but honestly, do we ever? ), I have truly experienced hope. Hope has become my word for this season, this year, and my life. This last year has been one of the most challenging, but also the most hopeful years of my life. I had my life all planned out and was ready for the next step, but in one conversation, that all fell apart. I was left devastated. In a time when my heart was broken and I didn’t know how to move forward physically, emotionally, and spiritually, God met me in the middle of my mess. When it would have been so easy to tell him “no,” something in me told me to tell God “yes,” and my life has been forever changed. This one small “yes” has led to the most fruitful season of my life. I chose to fight for my hope rather than sit in defeat where the enemy was waiting for me. For the longest time, my life and relationships with God, people, and myself were based on circumstance. I was so often let down because I lived my life rooted in circumstance and not in the truth of who God is. I am not defined by my circumstances. I am not the trials that I come up against. I am a daughter of the God of the universe. I am loved. I am seen. I am known. The hope that comes with these things is worth sowing into. As I read this passage now, I can honestly say that I have stood in each of these places. It had a different context than when this was written, but that does not diminish its power and worth. I never would have believed I would be one to rejoice in problems and trials, but that one little “yes” to God showed me how worth it it was to believe. I developed endurance by not giving into circumstance. This endurance became a part of who I am, choosing to believe in truth rather than submit to lies. It became a part of my character, which is my identity in Jesus. These problems and trials that I face have already been covered on the cross. I get to believe that Jesus knows me and the things I need most because He already chose what was best for me. Through His sacrifice, my suffering is not my own. I am not alone. I have hope that I am seen. I am known. I am loved. I was once a slave to circumstance, but now I am daughter of truth. Hope was offered to me, and I took it. I write this as a woman who was once hopeless and bound by the lies of this world and the enemy. God’s goodness is not in vain. He does not withhold good things from me, and I choose to believe in this rather than defeat. Hope is worth it. It is real. I have seen it. Father, You are good. I am sorry for the places I have chosen to place my heart in circumstance. I believe You are worth more than this world could ever give me. You do not let me down, and You do not disappoint me. I will choose to put my hope in You today. Show me where I need You more. Thank you. I love you. Amen. Kelly Riner is a Georgia College graduate, but now works for the University of Georgia Wesley Foundation and is a dawg at heart. She has perfected the disappearing behind the blanket trick and laughs more at her own jokes than other people do. 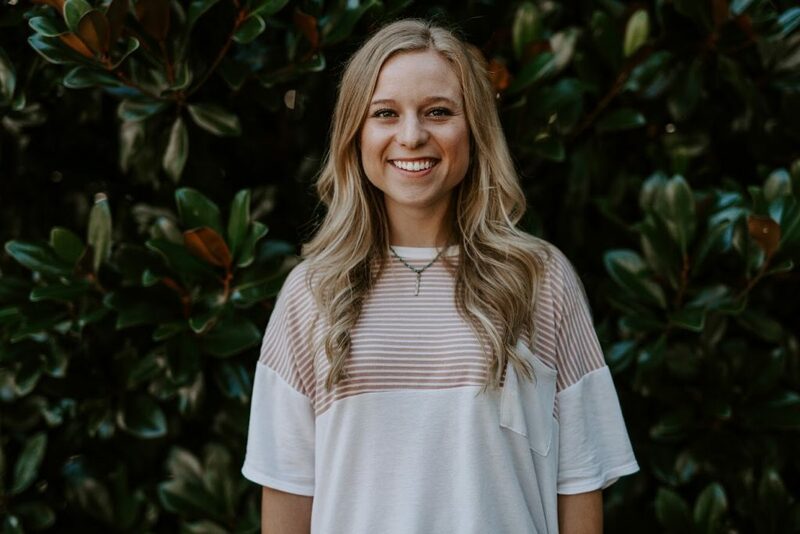 She believes in what the Lord is doing in Athens, GA, and she loves to see Him transform the hearts of the girls she disciples.